Athens Bar Show is an annual educational expo for bartenders and bar professionals. Last year's event surpassed the 9,000 guests mark, and attendance grows year after year emphasising the enormous potential of Greek bar scene which has come to be considered one of the most emerging worldwide. This year the Athens Bar Show will be held at the historic site of Technopolis City of Athens (100 Piraeus Str.) on November 5 and 6. The choice of site is not accidental since it is one of the most iconic places in the city, it is also in the city center and near the Kerameikos Metro Station. 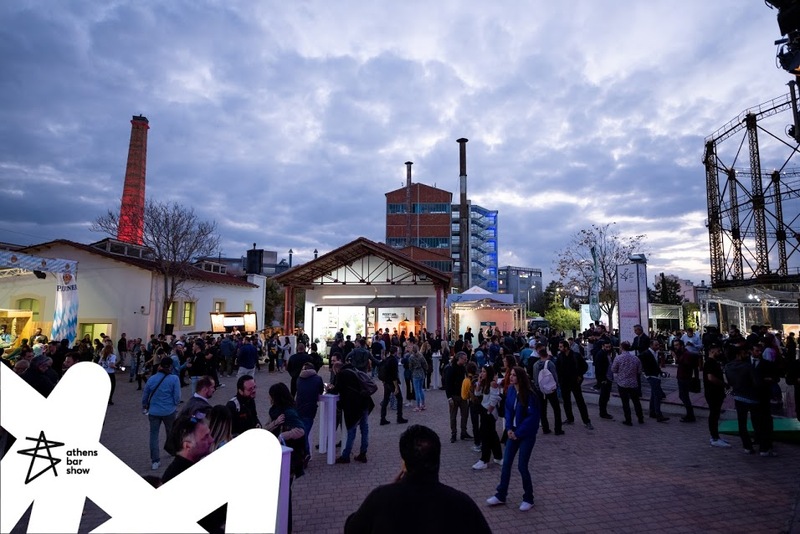 On November 5 and 6, the 7 rooms and 2 courtyards of Technopolis will be transformed specifically for the event needs, during which you will have the opportunity to meet the most renowned Greek bartenders, to be inspired by the most famous cocktail gurus of the global bar scene and learn about all the trends and news of the industry. Sample over 500 products, find solutions to your own bar, attend seminars and lectures by distinguished professionals and get inspired by ideas and innovations that are happening right now in the best bars in the world. On November 5 and 6, the heart of Greek bar scene beats in the Athens Bar Show! Use the Metro or one of the many public transportations serving the area for your convenience. When it first launched back in 2010 it was named “The Bar Academy Show” and was held in the Metropolitan Expo, next to the Athens airport. At launch, 9 exhibitors were visited by about 1.000 visitors. That was the beginning of an effort to establish an institution that would become the annual appointment for the bar industry. In the years that followed, Athens Bar Show was supported by every company that is involved with the industry, directly or indirectly. The year 2012 marks a special landmark when the Athens Bar Show is relocated to a venue in the center of Athens, namely “The Hub Events”. Visitors can now enjoy an easy, comfortable and above all safe access to the exhibition by means of public transportation. The visitor count in 2013 was an incredible 3.000 persons which signaled the need to relocate the 2014 exhibition to a larger and better-suited venue – Technopolis Municipality of Athens was selected. The exhibition grew very rapidly with 8.000 visitors in 2016 and in 2017, 8.500. In 2018 visitors had the invaluable opportunity to visit, meet and learn from exhibiting companies (domestic and international) and over 70 seminars, presentations, tastings, workshops and masterclasses. Athens Bar Show is regarded as one of the largest bar shows in the world where spreading education and knowledge is a principal pillar. Visitors to the exhibition, organized by Bar Academy, can stay informed with current and emerging trends, discover new and exciting products and equipment, learn and get inspired by successful business models, learn and grow through seminars and workshops. Who can visit the exhibition? All bar industry professionals such as bartenders, bar managers, F&B managers, entrepreneurs, waiters/waitresses, and assistants. Merchants, distributors, and representatives of companies and brands of the industry. Students of tourism schools and businesses. NOT allowed for people not professionally involved with the drinks and beverage industry. The organization retains the right to refuse entrance to any and both days of the event to any individuals, even with a purchased ticket. The company organizing the event is Bar Academy. You can fill the request form or call +30 6940711772 . Where will the Athens Bar Show 2018 take place? What hours can I visit? How much does the ticket cost and for how many days? The ticket costs 20€ during online presale (available soon) and 30€ for purchases at the entrance, it is valid for both (2) days. When you arrive at the door, you will receive a special bracelet-pass which is valid and required for both days so you can enjoy free access to all areas of the Athens Bar Show available to visitors. Is there an additional cost for attending seminars and presentations? No, all open presentations are free for all visitors of the Athens Bar Show. In what language are the seminars and presentations? Seminars and presentations will be either in English or in Greek. Translation will be available for English or Greek respectively through headphones you can receive at the entrance of each seminar room - you must have an I.D. card or passport to receive a headphone. Technopolis City of Athens has become a hub of cultural events, thus upgrading a historic area of the capital and creating another focal point in the cultural identity of Athens. A wide variety of cultural events are held in Technopolis every year: music, dance, theatre and performing arts, plastic and applied arts, educational programs for children, entrepreneurship and temporary exhibitions, attracting over 600,000 people annually.